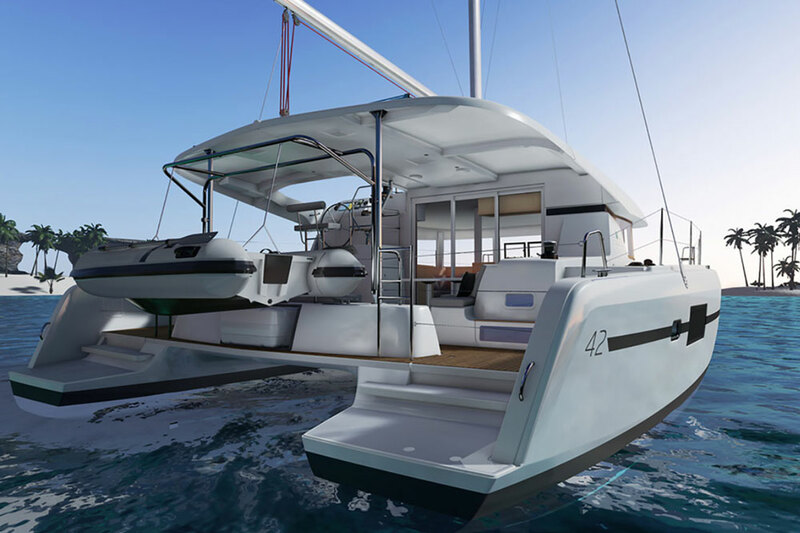 Does the new Lagoon 42 hint at what’s to come in the future for catamarans? 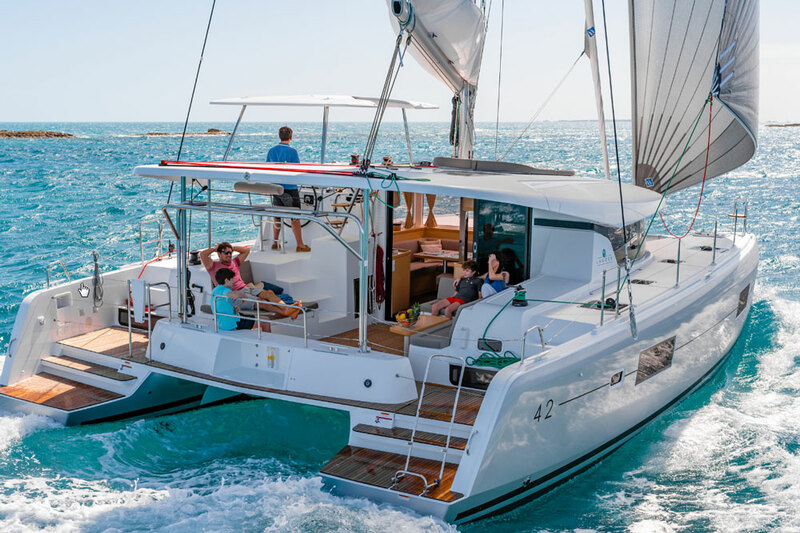 If you want to get a glimpse of the new Lagoon 42 sailing catamaran, watch our Lagoon 42 First look Video. But if you want to gain some real insight into this boat, know first that to create it designer Patrick Le Quement partnered with naval architects VPLP. The net result? An exterior that eschews hard angles for strikingly soft curves, from the gullwing under the bridge deck to the expansive coachroof. Know also that this new cat doesn’t just look different, she’s also easier to manage—even with a giant rig. 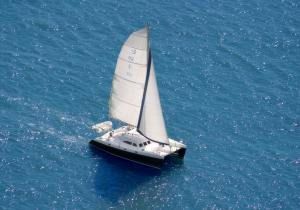 Upwind sailing is simple with the self-tacking jib on a track forward of the mast, and because VPLP moved the spar aft, the weight is centered to reduce pitching and allow for more headsail choices. 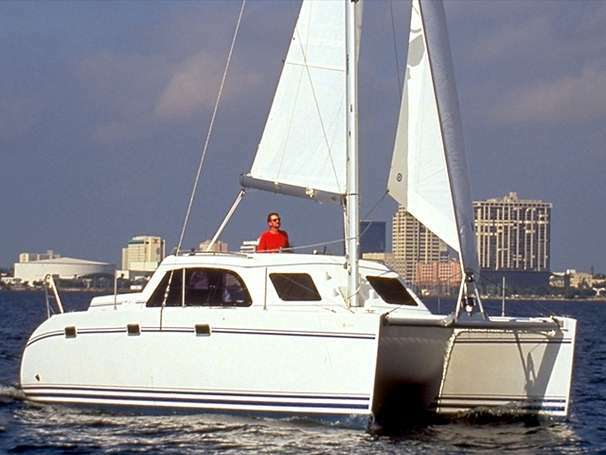 The shorter boom pairs with a taller mast for a higher aspect ratio sail plan, while the optional square-top mainsail adds another 40 square feet of sail area. 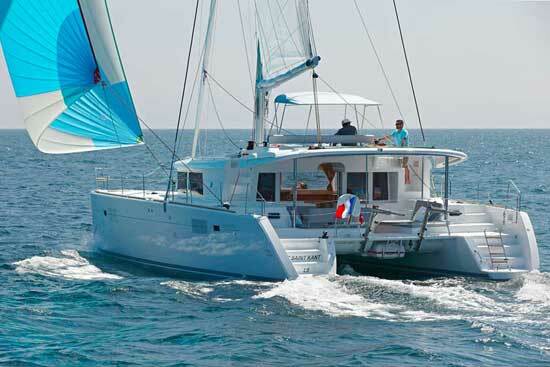 The new Lagoon 42 sailing catamaran replaces the popular 420/421, of which there are 270 hulls. Lagoon’s injection-molded construction created a light cat, at just over 26,000 pounds. The structural center beam adds strength and with the optional sprit, a Code 0 makes for great downwind runs, as we found out on our test sail. With a light breeze of less than 10 knots true wind, we headed out onto Biscayne Bay and under the center span of the Rickenbacker Causeway bridge. We had to choose the highest option because the Lagoon 42’s mast clearance is almost 68’, which will not make her ideal on the Intercoastal Waterway. But then, this cat was built to stretch her legs on open water and not worry about bridges. With the tall rig, we sailed on a reach at 6.1 knots in 10 knots of breeze. Surprisingly, even in the light conditions, the boat tacked easily without stalling as the bows came through the wind. The adventurous Lagoon skipper was eager to put all the new equipment to test on hull number two before heading off to the Caribbean, so up went the 732-square-foot aquamarine Code 0 that must have made us a spectacular sight on the Bay. At 75 degrees apparent wind angle, we sailed at nearly seven knots in just 10 knots of breeze. As we fell off to 110 degrees, that speed dropped to 5.3 knots. We wished for windier conditions (the boat later reportedly sailed 15 knots in 22 knots of true wind in Bimini) but with our light breeze, we dared to do the next best thing by sailing back under the bridge with the enormous gennaker flying. The new deck design improves traffic flow and makes it easier to move about while the wide transoms ease boarding from the dock or dinghy without any uh-oh moments. Despite her tall hulls, only two low steps lead up from the swim platforms to the cockpit. Eight diners can gather around the large table to starboard while another one or two may enjoy the lounge to port. For docktails, more guests may be accommodated on the small transom seat, just ahead of the davits. Steps on either side lead up to the main deck and forward to the bows. There are no visible handholds attached to the curved coachroof, which seemed odd to me until I ran my hand along its finished bottom edge and discovered an invisible “handle” that leads all around the front of the boat. It works and looks great. The smoothly finished fiberglass edge of the coachroof, however, has no nonskid, which will make it slippery for wet feet, and the only way to get up to the mainsail bag for anyone but the most agile is via steps at the helm. As far as helm stations go, Lagoon got it right with the command pod offset to port on the 42. With plenty of room for two people to work simultaneously, the steering station has a dedicated space for the driver as well as anyone working the lines on the two Harken winches inboard. Behind the double seat, there’s enough room for a third person to stand or pass through, down to the cockpit. The driver can easily communicate from the wheel with anyone in the cockpit or on the bows, and visibility is fairly good in all directions. Inboard, there are those aforementioned steps that lead up to the sunpad. 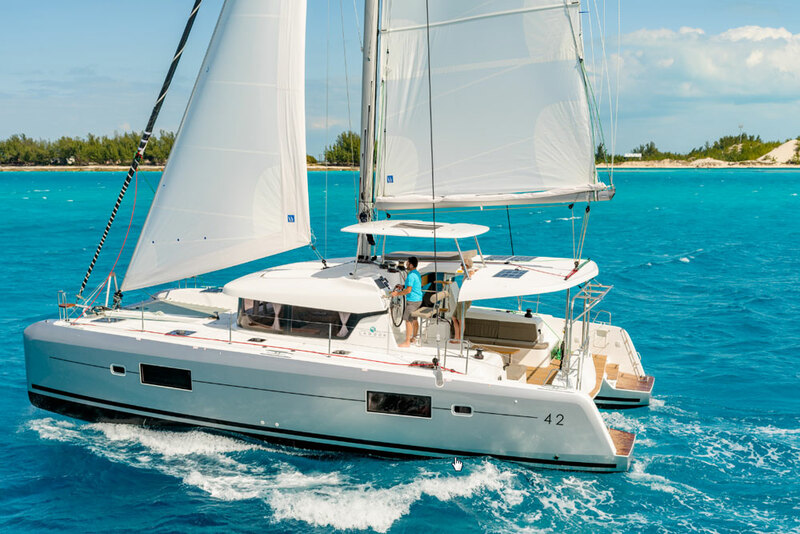 The hardtop over the wheel has been optimized for a clear view of the mainsail via a window cut into the composite roof, and there are a few well-placed handholds to keep everyone steady on their feet. This well-engineered helm means that a big powerful boat like the Lagoon 42 can be single-handed because everything, from the B&G multifunction display to the engine throttles, is within easy reach of the wheel. Standard power is provided by 45 HP Yanmar diesels, but our test boat had the upgraded twin 57 HP engines with Saildrives and folding propellers. On flat water, we cruised at 7.8 knots at 2000 RPM and topped out at 8.7 knots at 3200 RPM. Tankage is light for such a large, long-distance vessel, with only 79 gallons each of water and fuel, but there is an option to add fuel capacity as well as a water-maker. Our test boat had the three-cabin owner’s layout with the entire starboard hull dedicated to the private master stateroom. The head forward takes up nearly a third of the hull length, and has a huge shower with a nicely-appointed bathroom. Moving aft there’s a desk, and an island bed which is low for easy access. Large hull windows mean the captain can do a quick visual of the surroundings from his or her berth. The port hull has two cabins and two heads. The aft stateroom has the same low island berth as the master, and a private head with a separate shower stall. The forward cabin has a smaller head/shower combination but also has access to a bow compartment that may be used to stash luggage or extra gear. In standard arrangement there are three staterooms with the master to starboard, but there’s also a charter arrangement available with two cabins and two heads in each hull. On the main deck, the U-shaped galley is split with a three-burner Eno stove and a single sink to starboard and refrigeration to port. The top-loading refrigerator is at the edge of the portside stairs, where shorter people may find it difficult to reach into its depths while perched on the second step. In the saloon, the mast compression post is in the center. Although it’s something to dodge when moving about it does make a good handhold. A settee runs athwartships and forms the seat for the outboard-facing nav station, which has a second set of B&G instruments. 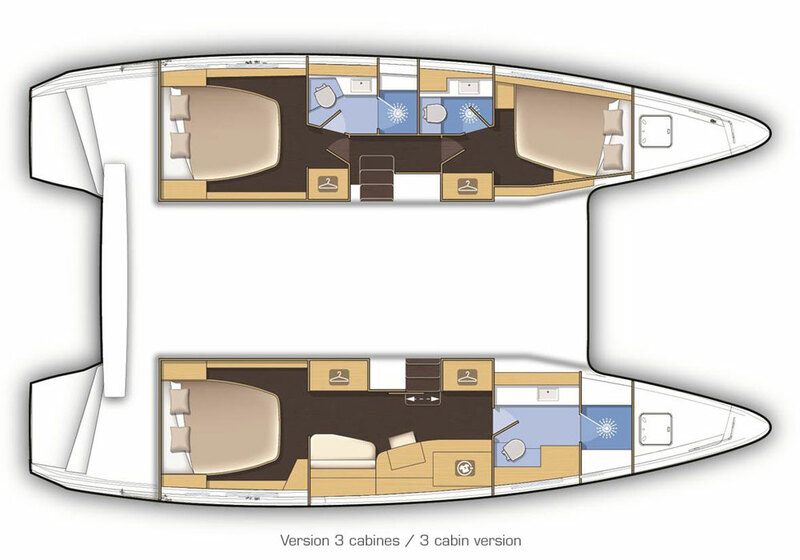 The saloon is roomy but could be better ventilated, since there’s no overhead hatch and the only opening ports are the two forward windows and the large three-panel glass door leading out to the cockpit. 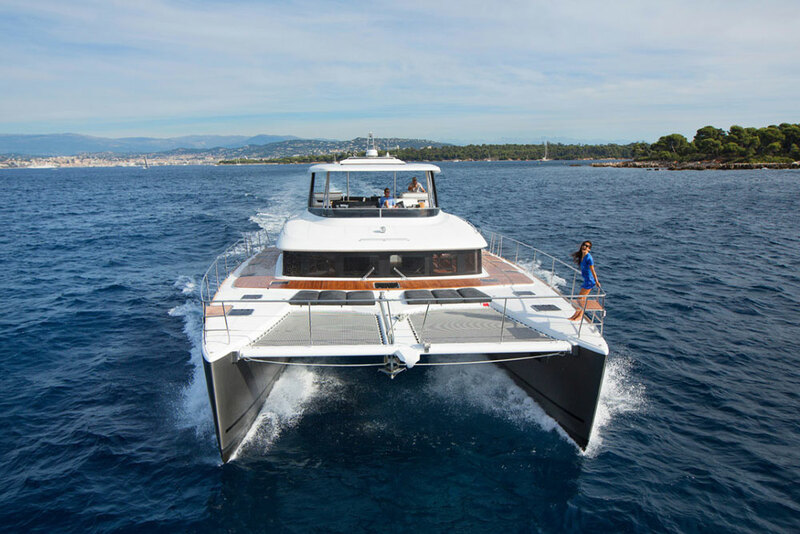 The 42 is meant to fill the gap between the Lagoon’s 400 and 450 models, because it’s a big jump from one to the other in both onboard real estate and in the wallet. 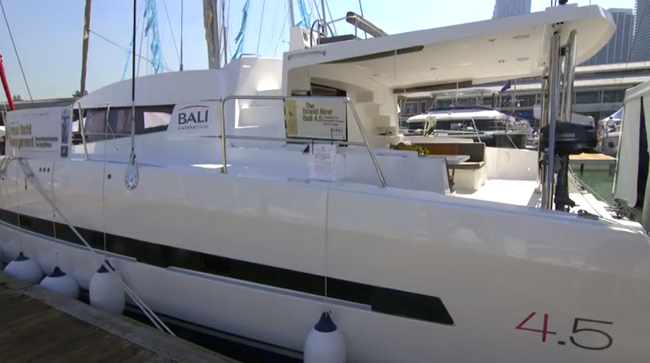 (The base price for the Lagoon 42 is around $342,000, though as-tested, the boat we sailed goes for about $460,000.) Time will tell if this new curvaceous aesthetic spreads to other models in the line, but Lagoon is definitely on to something with this new cool cat. 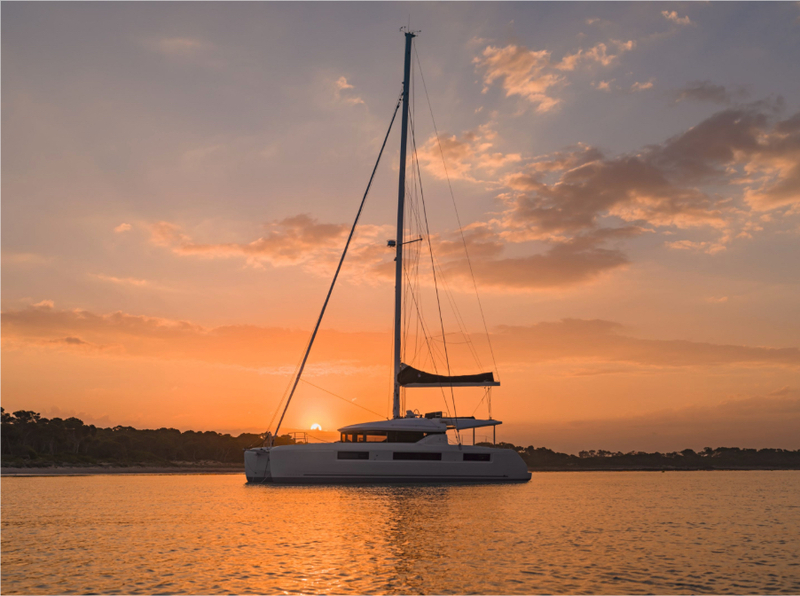 Other Choices: The Leopard 40 is another catamaran that will sail similar waters. 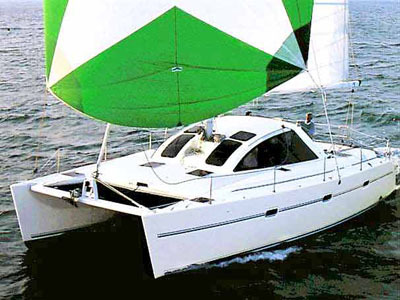 Same goes for the Nautitech 40 Open. For more information, visit Lagoon. Sail Area 968 sq. ft.